The weather didn’t look promising the morning of the 2018 Chicago Marathon, with gloomy skies, chilly winds and a rainy forecast. The precipitation held off for about 30 minutes before it started coming down steadily and refused to let up for the remainder of the race. 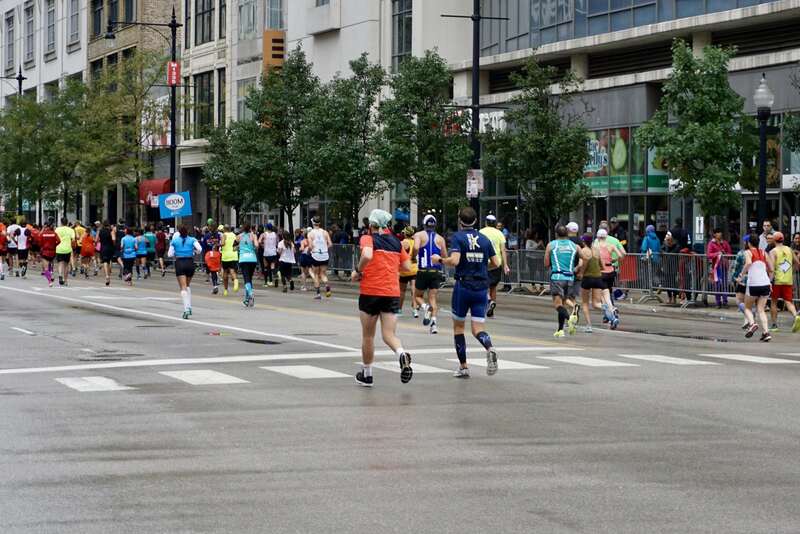 Like Boston in April, it was going to be a battle against the elements and the competition. In the men’s wheelchair race, 20-year-old Daniel Romanchuk (USA) of Champaign, IL, finished first in 1:31:34, just one second ahead of defending champion Marcel Hug (SUI). David Weir (ENG) took third. For the women, Manuela Schar (SUI) won in 1:41:38, with Madison De Rozario (AUS) coming in second and Susannah Scaroni (USA) from Urbana, IL, finishing in third. Surprisingly, Tatyana McFadden (USA)—a University if Illinois alumna, the course record holder and an eight-time Chicago champion—came in seventh. The elite men began with a group of about 10 runners clocking 30:11 at the 10K mark. At the halfway point (1:03:03), Kenyans Geoffrey Kirui and Abel Kirui led the way with Galen Rupp (USA), Mo Farah (ENG) and Mosinet Geremew (ETH) close behind. 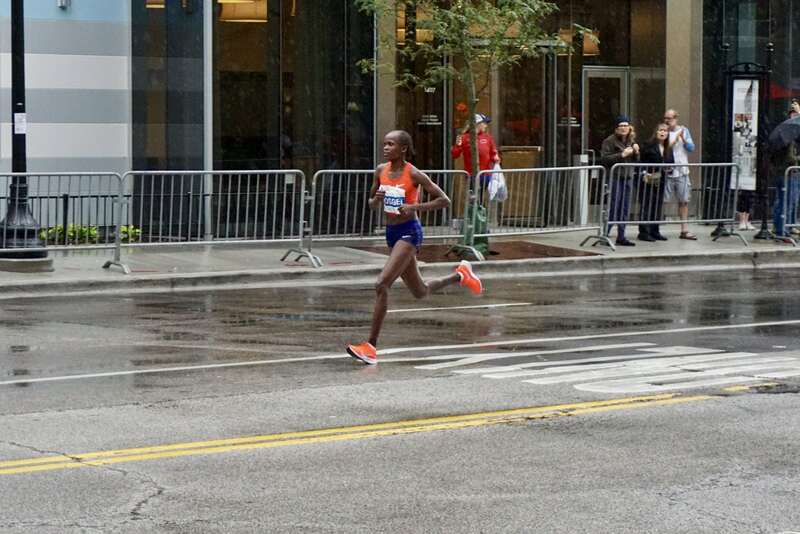 With just a mile to go, Farah was neck-and-neck with Geremew, but Farah was able to push ahead and win his first marathon with a European-record time of 2:05:11. Geremew came in second at 2:05:24, followed by Suguru Osako (JPN) at 2:05:50. Defending Champion Galen Rupp finished fifth. For the women’s race, the leaders passed the 10K mark in 33:24 and crossed the halfway point at 1:10:09, with Brigid Kosgei (KEN) and Roza Dereje (ETH) in the lead. Laura Thweatt (USA), who was in the lead pack at 10K, dropped out of the race between miles 9 and 10, leaving fellow Americans Sarah Crouch, Taylor Ward and Gwen Jorgensen to vie for spots in the top 10. 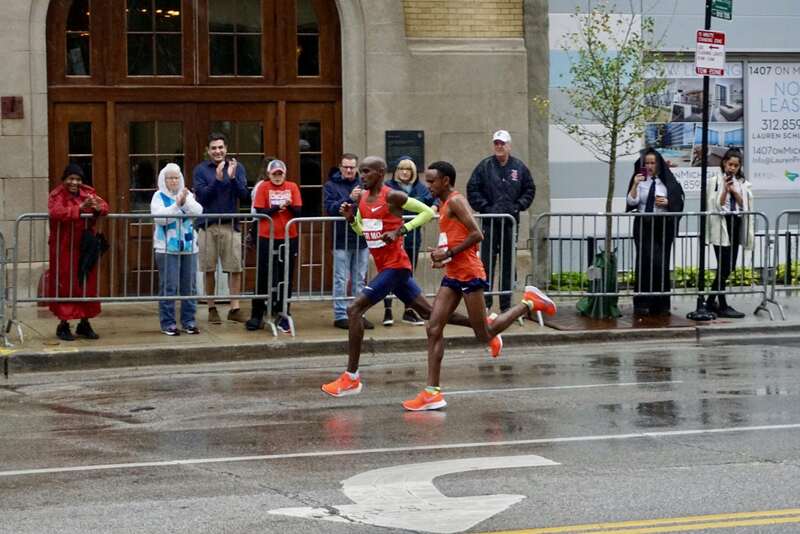 Between the 30K and 35K mark, Kosgei broke away from the pack and finished first with a personal best of 2:18:35, more than two and a half minutes ahead of Dereje who took second with a time of 2:21:18. Shure Demise (ETH) claimed third at 2:22:15. Crouch made the top 10, coming in sixth with a personal best of 2:32:37. Ward finished seventh and Jorgensen came in 11th. On a final note, many thanks to the volunteers, medical personnel, police and spectators who kept the race safe and lifted the spirits of thousands of athletes with their encouraging cheers. And kudos to all of the participants for braving the weather and fighting to the finish. We are inspired by you all!